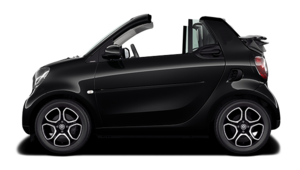 The inventory of new smart fortwo vehicles offered at Mercedes-Benz Laval will charm you with its choice of configurations and customizations. Come in today and discover all of the advantages of buying a smart, and enjoy its compact dimensions and 100% electric engine. With a smart fortwo, the city is yours. It would be impossible to find a car better suited to the city than the smart fortwo. The latter offers very compact dimensions that allow you to comfortably manoeuver in traffic, and its electric motor doesn’t need a single drop of gasoline. With the smart fortwo and the convertible version, you can go anywhere while having a blast behind the wheel of a vehicle that you can drive with your fingertips. Safety is also at the heart of the smart lineup. Despite the small size of the car, the smart fortwo and fortwo cabrio offer a wide choice of safety features, including several airbags and a rigid tridion structure that protects the occupants in the car. The smart fortwo may be small, but it’s still very safe. Numerous tests by top safety agencies have proven this time and time again. 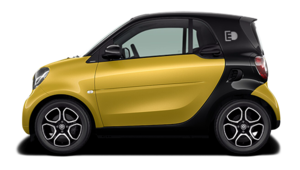 The smart is unique, fun, dynamic, efficient, and environmentally friendly. It is aimed at clientele that want to conquer the urban jungle while having fun driving their car. 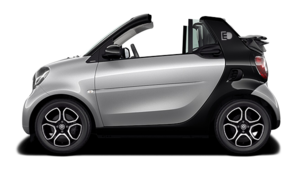 Learn more about the smart fortwo today at Mercedes-Benz Laval.